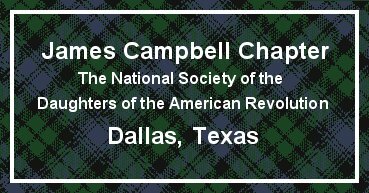 James Campbell Chapter was organized October 29, 1952, more than 60 years ago. This chapter was named for the Scots ancestor on whose service the organizing Regent, Mrs. Albert E. Hudspeth, joined DAR. 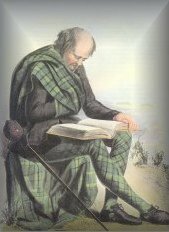 James Campbell was descended from Sir Colin Mohr Campbell who was knighted in 1280. Sir Colin Mohr Campbell's son married Lady Mary Bruce, sister of Robert, The Bruce. The James Campbell Chapter was one of the last chapters organized in time to have its membership recorded in the Bell Tower at Valley Forge. The name of our Organizing Regent and that of the Chapter are engraved on a plaque. Three scholarships have been established through the generosity of members. A C.A.R. Society, James Haynes, was organized on March 16, 1958. We welcome new members and offer assistance for proof of lineage, if needed. Our membership numbers more than 160, including several junior members. We average about 45-50 members at regular meetings. We meet the first Friday of each Month from September through May at 11:45 a.m. with a catered lunch. Please send us e-mail for directions to our meeting place.